As joyful as the holiday season is, it leaves many feeling sad and alone. Now that Christmas is past and spring in ahead of us, or at least we hope it is, time to start looking at our mental and emotional well-being. Often, after the holiday season, we start to encounter the post holiday blues. Some say it is a source of our northern roots, while others blame it on the anticlimactic holiday season and shock when those credit card bills start rolling in. It may be a bit of both, or just the fast pace that life has taken us. Regardless, we need to slow down and pause. Take the time to enjoy the people around you, to watch an eagle soar above or merely take a quiet walk down a snowy country road. One of my favorite tasks to do is sit quietly in my sewing studio as I cut pieces for my next quilt. I am always in awe of how peaceful I feel when I have taken time to take care of myself. If you tend to spend a great deal of time alone, it may be nice to join a group activity. 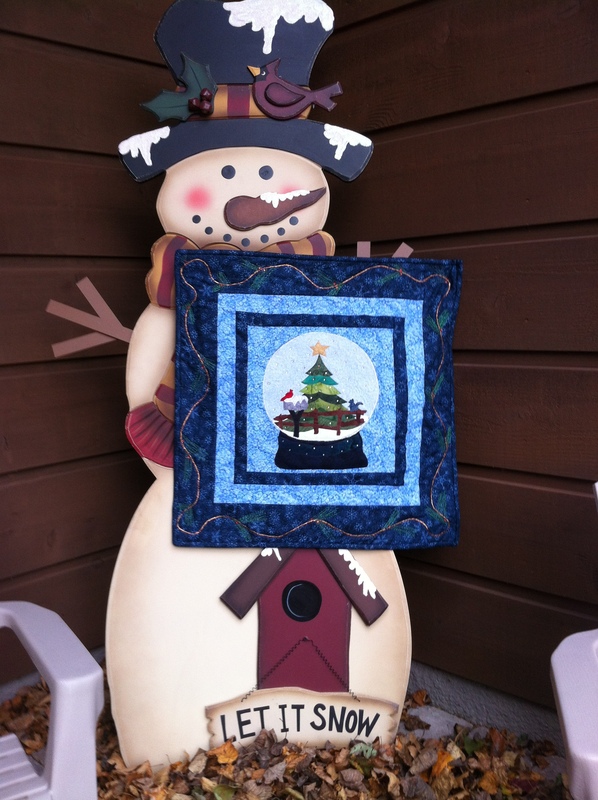 I offer many classes that fit the needs of the beginner to intermediate/ advanced quilter. 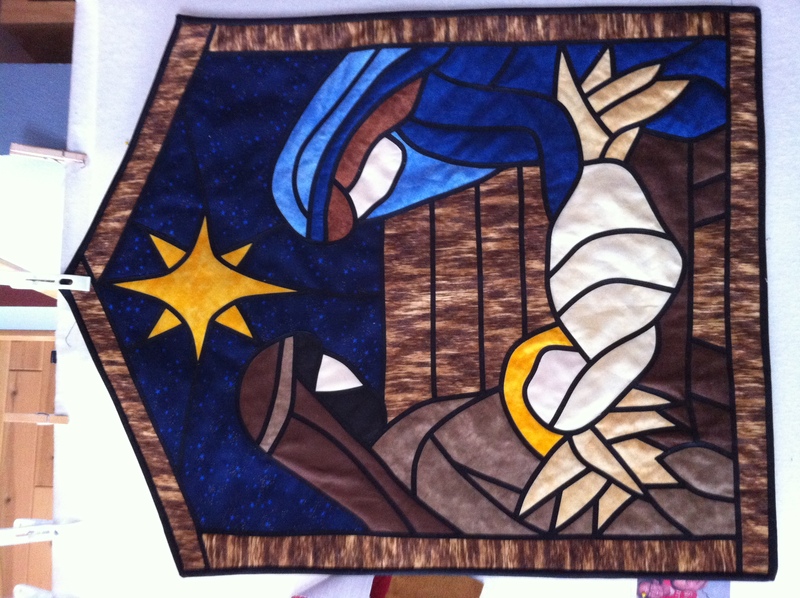 We find that as we cut, quilt or press, we are continually conversing and encouraging one another. I find that sometimes my choice of fabrics will say a great deal about my mood. 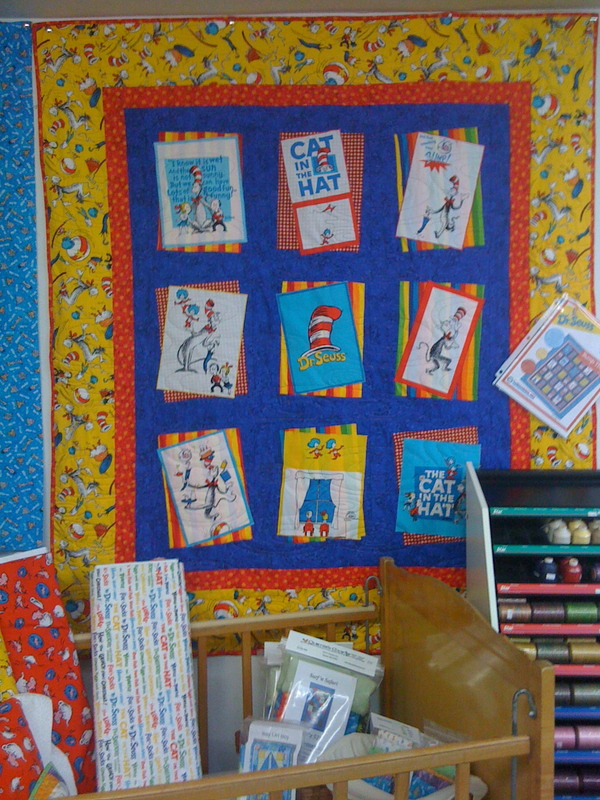 This Dr Suess Quilt is bright and cheerful, very much what I was feeling as I made it. A wonderful outlet could be physical activity, perhaps a yoga class or a good run. There are so many helpful ways to get through the winter funk, I’d love to hear about your favorite ways.Do you have a special activity that helps you regroup after you have gone through a difficult time? Do you deal with depression, seasonal or acute, let us know what you do to get through it. simply add your email to my list at the right hand side of page, and press join. This will let you know by email whenever a new post is put up. Then go to the top of the page and where you see the no response or comment, click on the words and scroll to bottom of page and leave your comment. I really look forward hearing from each of you. I will always reply when a reply is warranted. SO now, Lets leave some messages! Finally a smart blogger…I love how you might be considering and writing! Just killing some in between class time on Digg and I found your article . Not usually what I desire to examine, but it surely was completely value my time. Thanks. Thanks for the good writeup. It in truth used to be a leisure account it. Look advanced to far added agreeable from you! However, how could we keep up a correspondence? Well they’re certainly planning for an attack not necessarily for war. hey 🙂 what design are you currently making use of for this one? (this exact site) I kinda love this and I had been wanting to know if that is available. Hello there, You have performed an incredible job. I will certainly digg it and personally suggest to my friends. I’m sure they will be benefited from this web site. Great post on Do you have the winter blues? » Quilters Anonymous. Kudos How does car insurance work when you get your license? I hardly drop comments, but I looked at a lot of responses on Do you have the winter blues? » Quilters Anonymous. I do have 2 questions for you if it’s allright. Is it only me or does it give the impression like a few of these remarks appear like they are written by brain dead visitors? 😛 And, if you are posting at additional places, I would like to follow anything new you have to post. Could you post a list of every one of your public pages like your Facebook page, twitter feed, or linkedin profile? I do know this isn’t precisely on topic, however i have a web site using the identical program as nicely and i get troubles with my comments displaying. is there a setting i am missing? it’s possible you might assist me out? thanx. You ought to really take into consideration engaged on growing this weblog into a significant authority in this market. You evidently have a grasp handle of the subjects everyone is trying to find on this web site in any case and you might definitely even earn a buck or two off of some advertisements. I might explore following latest subjects and raising the quantity of write ups you put up and I assure you’d start seeing some amazing targeted traffic within the near future. Just a thought, good luck in no matter you do! What i do not understood is actually how you are not really much more neatly-liked than you might be now. You are very intelligent. You understand thus considerably when it comes to this topic, produced me personally imagine it from numerous varied angles. Its like women and men don’t seem to be interested except it’s something to accomplish with Lady gaga! Your individual stuffs excellent. At all times handle it up! Congratulations on possessing definitely one of probably the most subtle blogs Ive arrive throughout in some time! Its just wonderful how a lot you’ll have the ability to consider away from a factor principally simply because of how visually stunning it is. You’ve place collectively a fantastic weblog website area –nice graphics, movies, layout. This is certainly a must-see web site! Wow, fantastic blog format! How long have you ever been blogging for? you make blogging glance easy. The overall look of your web site is wonderful, let alone the content! Nice piece on Do you have the winter blues? » Quilters Anonymous. Kudos I have been actively seeking homeowners insurance and for some reason no one will insure a customer with a pet snake! My snake is a nonvenomous exotic breed that is extremely common as a pet (ball python). Any suggestions on a provider?. Yay google is my queen helped me to find this outstanding website ! Im a huge fan already, man. Youve accomplished a brilliant job creating positive that individuals realize where youre coming from. And let me tell you, I get it. Great stuff and I cant wait to read much more of one’s blogs. What youve got to say is critical and needs to be read. Hi there clever points.. now why did not i think of these? Off topic barely, is that this page pattern merely from an atypical set up or else do you employ a custom-made template. I use a webpage i’m in search of to enhance and properly the visuals is probably going one of many key issues to finish on my list. I have been browsing online greater than 3 hours as of late, but I never discovered any attention-grabbing article like yours. It is pretty worth enough for me. Personally, if all webmasters and bloggers made just right content as you probably did, the web will likely be much more helpful than ever before. My associate and I actually enjoyed studying this weblog publish, I was simply itching to know do you commerce featured posts? I am all the time trying to find someone to make trades with and merely thought I would ask. Highly rated post. I study one thing completely new on completely different blogs everyday. Deciding on one . stimulating to learn the paper content material from different writers and be taught a little one thing from their website. I’d like to apply sure of this content on my weblog you’re mind. Natually I’ll give a link right here we are at your internet-site. Appreciate your sharing. My neighbor and I were just debating this specific subject, he is often looking for to show me incorrect. Your view on that is great and exactly how I truly feel. I simply now mailed him this site to show him your personal view. After trying over your website I guide marked and shall be coming again to read your new posts! I’m still studying from you, but I’m bettering myself. I definitely love reading the whole lot that’s written in your blog.Hold the stories coming. I cherished it! it does but not as much as using chemicals. chemicals can help cleaning not make sense but enjoy side take place latter like Cancer, so in behalf of with leach because of meantime. I drop a comment whenever I like a article on a site or I have something to contribute to the discussion. Usually it’s a result of the passion displayed in the article I browsed. And on this article Do you have the winter blues? » Quilters Anonymous. I was actually moved enough to leave a thought 😉 I do have a couple of questions for you if it’s allright. Could it be only me or do a few of these comments appear as if they are written by brain dead people? 😛 And, if you are posting on other online sites, I’d like to keep up with everything fresh you have to post. Could you make a list all of your communal pages like your linkedin profile, Facebook page or twitter feed? I’ll immediately clutch your rss feed as I can not to find your email subscription hyperlink or newsletter service. Do you’ve any? Please let me know so that I may subscribe. Thanks. I don’t create a leave a response, but I read a few of the comments on this page Do you have the winter blues? » Quilters Anonymous. I do have some questions for you if you do not mind. Could it be just me or does it seem like some of the remarks look like they are written by brain dead folks? 😛 And, if you are writing on additional sites, I would like to keep up with everything fresh you have to post. Would you post a list of every one of your public sites like your linkedin profile, Facebook page or twitter feed? wonderful issues altogether, you simply received a logo new reader. What could you suggest about your submit that you just made some days in the past? Any positive? Spot on with this write-up, I truly suppose this web site needs far more consideration. I’ll most likely come again to learn more, thanks for that info. Our Block Party was a Success! What Time is It?